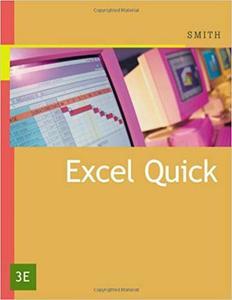 Excel Quick is designed for busy people who need a quick understanding of Excel. The goal of this tutorial is to get you up and running in Excel within one hour. Written for business students, the book has many real world examples. This tutorial covers Excel 2007, but also includes prior versions of Excel 2003, Excel 2002 XP, Excel 2000, and Excel 97, discussing the differences where they exist.